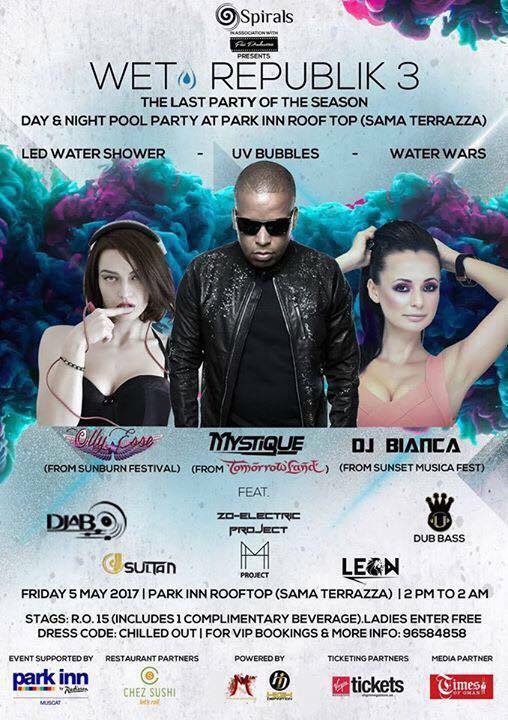 On Friday for the 3rd year in a row, Wet Republik 3 runs from 2pm till 2am. It features no less than 9 DJ's, some flown in just for the party, and should be fun time. Men are RO 15 with a complimentary drink, women are free. Tickets are available at the Park Inn reception, along with also at Chez Suhsi in Al Mouj and Qurum. Tickets are also available online at Virgin Tickets. For more information and VIP bookings, call 9658 4858 or check the fb event page here.